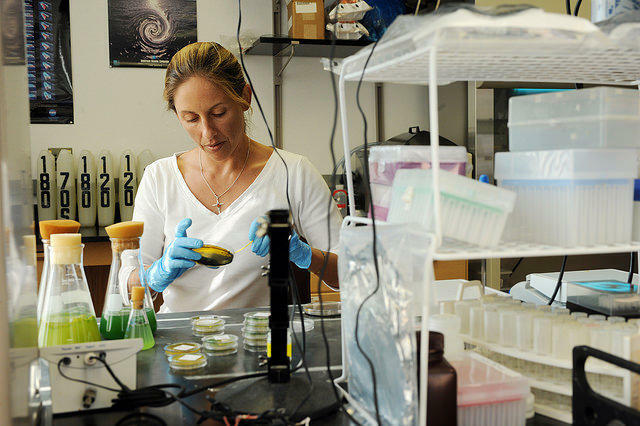 Dr. Rachel Noble of the UNC-Chapel Hill Institute of Marine Sciences, examines water samples in her lab taken from a beach near Morehead City. A new method to rapidly test shellfish for harmful bacteria has been discovered in eastern North Carolina. We talk to lead researcher Dr. Rachel Noble about the kit they’re developing, which yields results in just a couple hours instead of days. New technology is helping shellfish lovers stay healthy. You may remember two years ago when we reported on a local scientist who developed a new method of rapidly detecting polluted water. Now, Professor at the University of North Carolina’s Institute of Marine Sciences in Morehead City Dr. Rachel Noble is using a similar technique to test shellfish harboring dangerous bacteria. Sampling all 912 shellfishing sites in the state is conducted by the North Carolina Department of Environment and Natural Resources in a certified lab. The bacteria culture requires an incubation period and time to multiply so it can take days between a test and results. Dr. Noble says her method is much faster. The Rapid Vibrio Pathogen Kit relies on technology called quantitative PCR, or polymerase chain reaction that allows scientists to measure a specific DNA molecule and make many copies. Dr. Noble says an amalgamation of five to ten different oysters or clams make up a shellfish sample. Less than sixth of a teaspoon of tissue sample runs through the desktop printer sized quantitative PCR machine, commonly used to amplify segments of DNA. After about twenty replications in only a couple of hours, millions of copies are produced allowing scientists to easily detect target DNA. Dr. Noble says the method can be used to test for the presence of harmful bacteria found in raw in oysters and clams, known as vibro vulnificus and vibrio parahaemolyticus. The presence of vibrio vulnificus is higher during the summer months as water becomes warmer. According to the Food and Drug Administration, symptoms of a vibrio infection usually occur within 24 to 48 hours of ingesting raw shellfish and may include sudden chills, fever, nausea, vomiting, diarrhea, shock, skin lesions and in some cases death. Since there’s no way to tell visually if an oyster can cause an infection, the only way to know for certain is through testing. So far, shellfish testing employing the quantitative PCR technique has only been conducted in a laboratory. But Dr. Noble hopes to develop portable and user-friendly kit for scientists that would require only water and an oyster tissue sample. The goal is to be able to use the testing kits in the field. For instance, shellfish samples could be collected in the Pamlico Sound, analyzed on the back of a boat and within two hours, scientists could know if unsafe levels of bacteria are present in the testing area. Not only would the technology benefit shellfish sanitation, the kits, which would cost $20 to $30 per test would prove valuable to the aquaculture industry, food service and medical field. Dr. Noble is leading a team of researchers in the process of developing a limited version of the kit, expected in a couple of months. She says the goal is to create a single kit that would be able to detect various forms of bacteria in shellfish samples. This research project is conducted by Principal Investigator Dr. Rachel Noble, Professor Jim Oliver from the University of North Carolina Charlotte, Marine Bio Technology Center of Innovation Roy Carter, Peter Lial from University of North Carolina Chapel Hill’s Office of Technology and Development and faculty from the Institute of Marine Sciences in Morehead City.